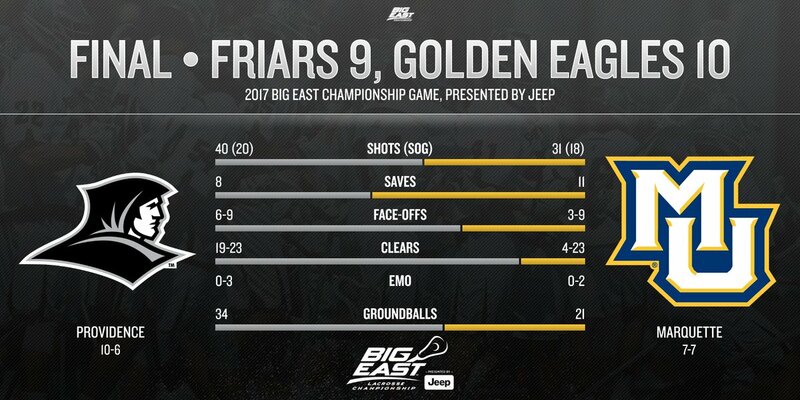 Providence had a chance to win their first Big East Tournament Championship on their home field against last year’s Big East Tournament Champion Marquette in front of a crowd of 2,398 on a perfect day for college lacrosse. From all accounts from those in attendance, both coaches, and the guys on the field, the crowd and atmosphere were unbelievable as they witnessed a spectacular game from both teams in a back-and-forth match. Providence was able to start quickly and take a 2-0 lead right off the bat while also holding the Golden Eagles scoreless in the first frame. Marquette answered the call with 4 straight goals of their own to take a 4-2 lead and 4-3 lead into the half after a goal by leading PC goal-scorer Brendan Kearns (31 on the season). Senior Ryan Schaffer netted his second straight hat trick in this game with all the goals coming in the second half, pouring in another three goals for the Friars while Ryan Nawrocki put two in the back of the net. Those two guys helped Providence tie things up at 6-6 heading into the 4th quarter. Marquette was able to score the eventual 10th goal and game-winner with 4:04 left in the 4th quarter. They needed every single one of their goals as Providence made a valiant comeback attempt at the end of the match, narrowing the margin to 1 with a goal by scoring goals with 1:44 and 1:25 left in the game, both by Schaffer. PC had a chance in the last seconds but a costly turnover sealed the game for the Friars in the end. The killer for Providence in the game were the turnovers that don’t show up on the above stat sheet for the game. The Friars had a total of 16 turnovers, 11 of which came in the 2nd half. It was their face-off edge that really helped PC stay pretty even with Marquette throughout the match. Some additional highlights from the game for your viewing pleasure. Head Coach Chris Gabrielli has done a great job with the Friars lacrosse team in his fifth year with the school as they were able to win their first ever Big East Tournament game this year against #15 ranked Villanova in the Semifinals. The Friar squad looks poised to potentially take that next step as a team next season, especially with Big East Goaltender of the Year Tate Boyce returning as a Junior next year.